I first started backpacking as a teenager in England. I did a month-long trip in the Arctic but most of my backpacking experience has been weekend to 10-day trips, in a range of terrains and climates. I am a volcanologist so also do day hikes carrying loaded packs over intense terrain. Nowadays I am nearly always in sub-tropical or tropical climates. I am heading more and more towards ultralight packing, and unless I am sharing I use a bivy rather than a tent. I try to pack under 20 lb (9 kg) for long weekend trips but have carried over 50 lb (23 kg). This is a small dry bag that fits my camera, purse and keys. According to the website it is made of tough polyurethane and seals hermetically. The front is clear and the back is blue, made of thick but pliable plastic. There is a small, thin envelope on the front that fits a piece of paper for a name. 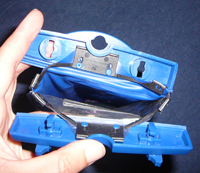 The top of the pak has solid plastic on both sides which fit together. One side has a loop on the top to attach the included cord and/or carabiner. 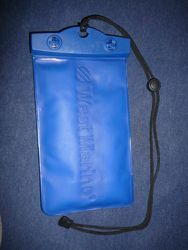 The other side and the blue plastic side of the body both have the west marine logo imprint. To keep the sides together there are two clasps on the plastic at the top of the front that fit through holes on the back and rotate 90�. I bought this pak on a whim and it got its first test 30 minutes later when I took it kayaking to see the MacDill Airfest in Tampa, Fl. Temperatures were around 80 F (27 C) and it was constant, bright sunshine. Although it did not get immersed, it got splashed many times. Since then it has been on 13 other kayaking trips around Florida totalling well over 100 miles, with temperatures between 70 F (21 C) and 100 F (38 C). Weather has ranged from (usually) glorious sunshine to huge rain storms. I have also taken it on car-camping trips around Florida. The first one of these we also took kayaks and kayaked out to see a shuttle launch at Cape Canaveral. I capsized three times getting into the kayaking in big waves, so that the dry pak has definitely been put through its paces! I had been looking at waterproof cases for my camera but wasn't willing to spend the money. I needed something immediately so bought this dry pak but kept the receipt meaning to take it back. However, after using it for the first day, I decided to keep it and have liked it more with each use. The size of the pak is perfect to fit cell phone, keys and camera, the things that I want to keep waterproof and safe when near the water. The pak has got wet numerous times and been dunked during capsizes more than once. Nothing inside has ever got wet. The first two occasions I took it out, in really hot weather, there was a little condensation in the pak, but it didn't affect anything in there and it has stayed perfectly dry inside ever since. The pak is well constructed and designed. The clasps take two hands to open and are fairly stiff, so there is no way that it will fall open. I would have liked to be able to open it with one hand, but I am used to it now and it makes it less likely to open and ruin things. When it is open it is easy to get things into and out of, especially because the solid plastic tops hold it in shape. I really like the fact that I can sit in my kayak with it between my knees but open so that my camera is protected from getting splashed but is easily accessible, and then I can quickly close it when I'm no longer taking pictures. The included cord means that it is easy to carry the pak around too. Because there is air inside when it is closed and the plastic is thick the contents feel a little bit padded. The air inside also means that the pak floats really well. 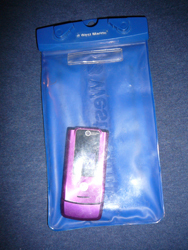 On the website they say that you can use a phone or GPS through the plastic but I haven't needed to try that. I did like the idea of both sides being clear plastic so that I could take pictures while it was still in the pak, but that isn't offered and when I tried to take a picture through the clear plastic it was too thick to get a good shot anyway. Because the plastic is thick I haven't even come close to puncturing it yet, even though I keep my keys inside and have put weight on it before. Although this pak has had a lot of rough usage it really isn't showing any signs of age. This is a good quality, fairly small dry pak that is perfect for medium-sized electronics or (in my case) camera, phone and keys.